« French Art – Vive la France! Imagine visiting the Dallas Museum of Art to see your favorite painting by Claude Monet or Jackson Pollock. Now imagine how you might experience those works without your vision. How would you “see” them? 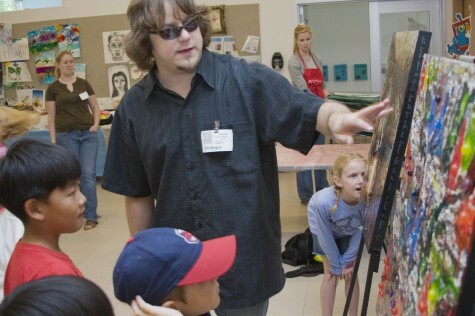 That’s exactly what I did at a workshop with artist John Bramblitt, and this is what visitors to the Museum’s Center for Creative Connections will have a chance to experience in October when John rejoins us as the Artist of the Month. John as our guest artist during a summer camp this year. October is Art Beyond Sight Awareness Month, organized by Art Education for the Blind to make art and culture a part of life for adults and children affected by sight loss. 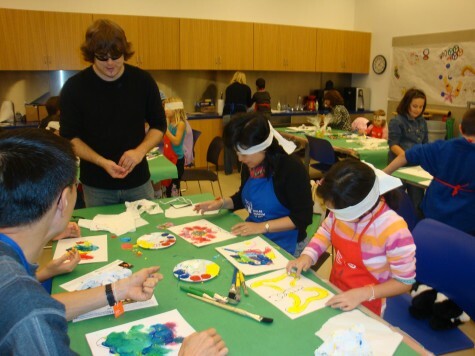 At the DMA, we’re planning some cool programs for kids and adults with vision impairment, but we’ll also repeat a family workshop that I took with John that shows how we can make art using our other senses. John leading a family workshop last October. Always passionate about art, John didn’t begin to paint until he lost his sight almost ten years ago while in his late 20s. His work is intensely personal, taken from real people and events in his life. 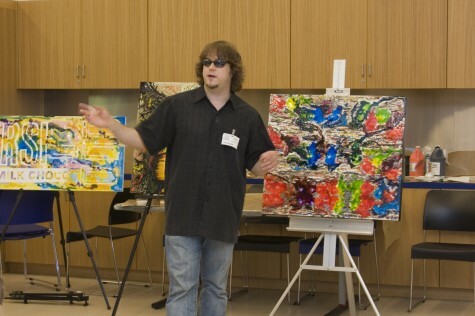 And his art-making workshops are unique, spanning the gap between beginning and professional artists, and including adaptive techniques for people with disabilities. DMA campers learning more about John's method for sightless painting. He’s developed a method of sightless painting that centers on the textures of paint in order to distinguish the color of it. When I worked with him, we mixed flour into the red paint, birdseed into the yellow, and sand into the white, and added nothing to the blue. 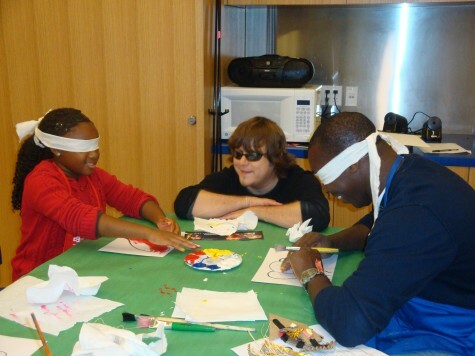 We put on a blindfold and were asked to imagine what we would be painting, to “see” it first in our mind’s eye. Then, touching the colors and using our fingers, we painted. The texture of the paint lets the families know what color they are using. This workshop, and many more exciting hands-on activities with John, will be held at the Museum during October. For more information, visit http://www.dm-art.org/Family/AccessPrograms/index.htm . To learn more about John Bramblitt, visit www.bramblitt.net. I noticed that the online collection database at the Dallas Museum of Art website has been down, or inaccessible, for some time. Is it going to start working again?? Please help! This is a valuable resource! Hi Edward, thanks for your comment. We’re currently working on this drive and making improvements–so for the next couple of weeks it’s going to be a bit unstable. It is up now and we’re keeping a vigilant eye on it to make sure that it stays up until the fix is in place!